Just because science fiction has a low budget, doesn't mean its alien creatures need to look silly or ho-hum. Here are 10 low-budget alien spectaculars that blew our minds. Here are ten aliens that were obviously done on a shoestring budget, but which absolutely knock your space boots off. Top image via Davosmith on Flickr. 10. The Daleks, on Doctor Who. The evil genetically engineered cyborgs on Doctor Who are like mini-tanks with buzzing bee voices, and they scared the pants off generations of British (and some American) kids. They've had their ups and downs — if the first Dalek story you saw was "Day Of The Daleks," "Destiny Of The Daleks," "Remembrance Of The Daleks" or the recent one where they turn people into pigs and then dress in zoot suits, you won't understand what the fuss is about. 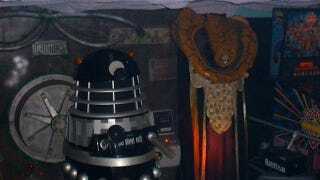 Watch "Genesis Of The Daleks" or "Dalek." (Before you jump on me in comments, I do like "Remembrance," except the Daleks wobble horribly and look just decrepit.) In their prime, though, the Daleks glide along, rasping with anger and pointing their terrible egg-whisk guns. They're utterly cheap — and horrifying. Runners up: It's debatable whether the Cybermen are aliens, but they do often look cool. Also, the Draconians and Zygons make the rubber-mask thing look brilliant, and the Forest of Cheem also doesn't look bad at all. I also like the Slitheen, but only design-wise. 9. The Aliens from The Arrival. Directed by David "Pitch Black" Twohy, this 1996 alien invasion film was probably made for three Snickers wrappers and a handful of arcade tokens — but I really love the look of these aliens, and they way they move on their weird satyr-ish horse legs. Here's a slinky alien transforming itself into a hawt babe, probably because it just watched Species. Also, I love the flaps that cover up its brain, and how they undulate. Nice stuff! 8. The Visitors from V.
They look human most of the time, but when we get the occasional glimpse of their real lizard faces under their human masks, it's super-effective — as long as we don't linger. Here are a couple of choice moments. I love Diana picking at the shreds of her human disguise, like they're a scab (at about 4:00 in the first video). And the speech in the second video is the greatest thing ever. 7. Greedo and the other cantina aliens, in Star Wars. Weirdly, later live-action Star Wars movies have never featured aliens that felt as interesting and lively as the first glimpse we got in that cantina scene. Of course, we've already exposited about our love for Greedo, but all of the quick glimpses of aliens in this scene have a liveliness that makes you feel like they're each the star of a cool story. Not bad for an underdog film with a tiny $8.5 million budget (not much even in 1977) whose crew was busy trashing the set and making fun of the Wookiee costume. 6. The Jem'Hadar in Star Trek: Deep Space 9. They actually jumped out at me when I was compiling pics for the post about silly-looking facial prosthetics last week — there was a picture of a Vorta surrounded by Jem'Hadar troopers, and I had to crop the Jem'Hadar out of the image, because they actually looked kind of cool. Something about the way their prostheses work with their faces really feels realistic, and all of those scenes of them struggling with their addiction to ketracel white feel engaging rather than run-of-the-mill. Runner up: Species 8472 in Voyager had some moments of genuine creepitude as well. 5. Black Oil in The X-Files. A sentient alien virus that can live in hibernation for thousands of years, it appears as a liquid, not unlike crude oil. But it can move on its own, and it's sentient, and it can take people over. There's nothing cheaper than just having some black goo oozing around, and yet it's completely convincing and compelling, and doesn't feel like any life form you've encountered on Earth. 4. The Aliens in District 9. Obviously, this movie's still fresh in our minds, but the downtrodden aliens in the film look different than anything we'd already seen. Their twitching face-tentacles can't help grossing you out a bit, even as their big pleading eyes lay claim to your sympathy. With a budget of around $30 million, this film is the equivalent of Star Wars or Alien back in the day — a low-budget film that succeeds thanks to a lot of inventiveness born of desperation. And great storytelling, of course. I almost left this film off the list, because we've covered it so much lately, but it clearly belongs. 3. The Vorlon from Babylon 5. These energy-based life forms are among the First Ones, and inspire a quasi-religious awe among people who see them. So its fitting that their headgear and robes look so alien and unfamiliar. As Sheridan tells Kosh at one point, he can't even tell if it's the same Vorlon under all that covering, or different Vorlons in the same guise. 2. The 456, on Torchwood. To me, this is the absolute best way to do an alien species on a budget. Shroud it in toxic smoke — and mystery — and just show little glimpses of evil tentacles. The way these creatures shriek and spatter the walls of their enclosure with alien puke will stick in your mind long after you're done watching the miniseries "Children Of Earth." This official still is actually a better look at the 456 than we ever get in the actual television show — and even in this image, they're somewhat indistinct and obscene looking. They're the perfect mixture of mysterious and disgusting, just right for aliens who want to molest your children. 1. The Xenomorph, from Alien. This post originally appeared on io9 in August 2009. Thanks to Alan Bostick, Alasdair Stuart, Madeline Ashby, @Nightwyrm on Twitter, Marlin May, Andrea Zanin, Melinda Adams, Rina Weisman, Micky Shirley, Susie Kameny, Greta Christina, Serene Vannoy, Rus McLaughlin, Minal Hajratwala, Annelise Ophelian, Seth Kaufman, David Fraser, and James Limbach for suggestions!